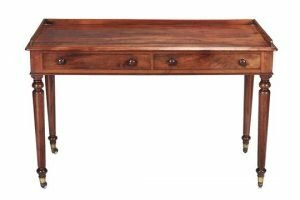 A George III walnut low boy, the rectangular top with a moulded edge above a single frieze drawer, raised on four cabriole supports with pad feet. 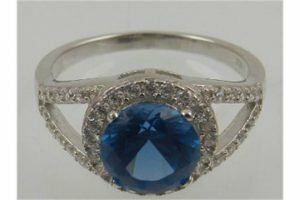 A silver, cubic zirconia and synthetic blue topaz cluster cocktail ring. 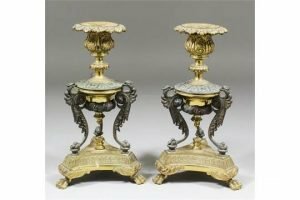 A pair of late 19th Century cast gilt brass and bronze candlesticks in the “Empire” manner, the column supported by three griffin on a triangular base with paw feet. 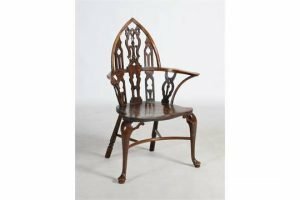 An 18th century yew, elm and ash Gothic Windsor armchair, probably Thames Valley, with pierced Gothic splats and shaped seat, raised on cabriole supports with pad feet united by stretchers. 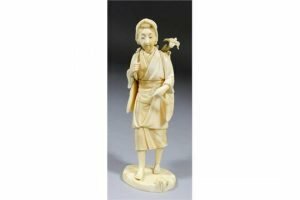 A 19th Century Japanese carved ivory standing figure of a woman carrying a basket of flowers on her back, on circular base. 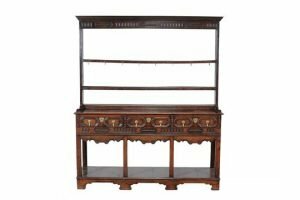 A Shropshire oak dresser, late 18th/early 19th century, the plate rack with moulded cornice, three shelves and applied hooks above the base with three short drawers each with moulded fronts, decorative frieze and square section supports leading to pot shelf under-tier and bracket feet. 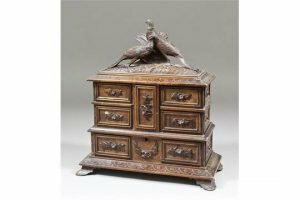 A 19th Century “Black Forest” carved wood jewellery cabinet, carved with swags of flowers, surmounted by two game birds, the lid lifting to reveal four hinged compartments and a deep recessed base, on four bracket feet. 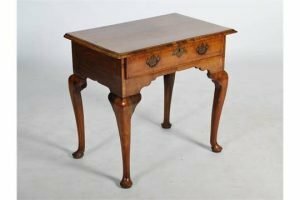 A William IV mahogany writing table , circa 1835, the top with moulded edge and three-quarter gallery above two short drawers, one stamped John Taylor & Son, Edinburgh, and on turned tapering legs, brass caps, and casters. 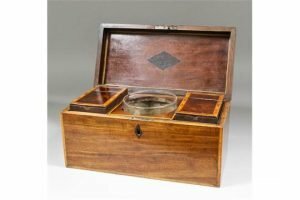 A late Georgian mahogany and crossbanded tea caddy of rectangular shape, the fitted interior with two caddies and glass mixing bowl. 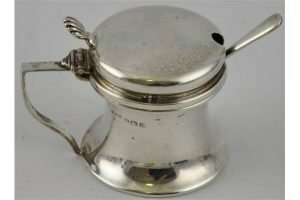 A solid silver Georgian style mustard pot with original liner and spoon Birmingham 1919. 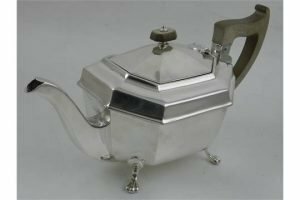 An Art Deco silver teapot, of octagonal form, raised on paw feet, hallmarked E. Vander Sheffield 1938. 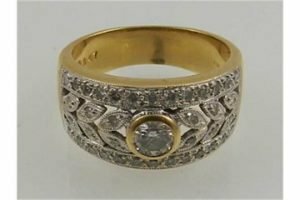 A yellow gold and diamond set band, the central stone mounted in yellow gold set with further diamonds forming a leaf motif. 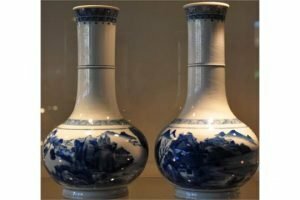 A pair of Chinese Blue and White vases decorated with pastoral scens, bears six character kangxi marks to bases. 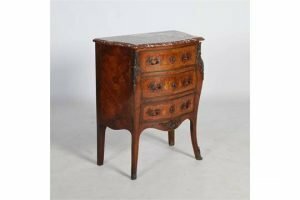 A French Louis XV style kingwood, marquetry and gilt metal mounted serpentine commode, the mottled red and white marble top with a moulded edge above three long drawers, raised on splayed square section supports with foliate carved sabots. 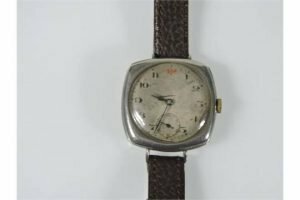 A silver cushion shaped wristwatch, the unsigned dial with Arabic numerals and subsidiary dial at 6 for constant seconds, fitted brown leather strap. 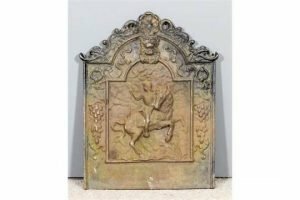 A 20th century cast iron fire back, the central design of a knight on a rearing horse after a 17th Century original. 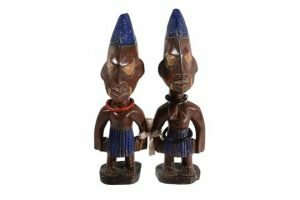 A pair of carved and painted wood models of the Ibeji twins, Yoruba, Nigeria, late 19th century, portrayed standing and sculpted in a stylised manner. 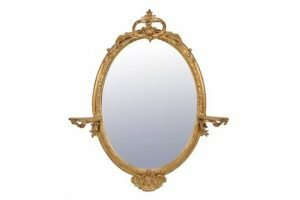 A Victorian carved and composition oval wall mirror , circa 1870, the plate within a foliate decorated moulded frame, flanked by a pair of serpentine fronted shelves with foliate supports, surmounted by a pierced scrolling foliate motif. 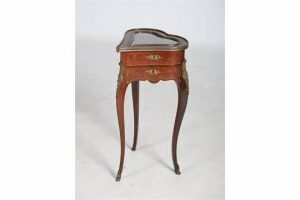 A late 19th century rosewood, parquetry inlaid and gilt metal mounted heart shaped bijouterie table, the hinged top with a bevelled glass insert, opening to a velvet lined interior above a small drawer, raised on three cabriole supports with foliate cast mounts and scroll cast sabots. 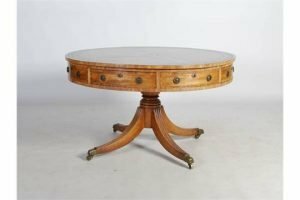 A 19th century mahogany drum table, the circular top with a green and gilt tooled leather insert, above four frieze drawers divided by four false drawer fronts, raised on a turned column and four downswept supports with fluted detail, terminating in brass toes resting on casters.